When Arla Vaughn accepts the role of temporary Dean of Archaeology, the museumâ€™s purchase of an elaborate Mayan mask seems an evil portent. The dual face, one side a handsome Mayan nobleman, the other side a skull-like visage with a glimmering obsidian eye represents the good and evil of mankind. Three years ago Jordan Lundâ€™s wife was strangled on campus and he has devoted his life to finding her killer. When a second woman from Arlaâ€™s department is murdered in the same way, the police believe this is the work of a mysterious serial killer known as The Scarlet Strangler. But Arla soon links the brutal murders to the dig in Copan. Her investigation takes her to where the mystery has its roots, the Copan ruins in the jungles of Honduras. 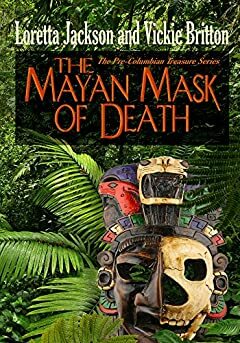 There, to uncover the truth, Arla must match wits with a killer as duplicitous as the Mayan Mask of Death.